SATMED is an open platform for the health community. Serving non-governmental organisations, hospitals, medical universities and other healthcare pro¬viders active in resource-poor areas, it provides open-access e-health services. Its tools can be used to support projects in areas such as e-care, e-learning, e-surveillance, e-health management and e-health financing. Contract extension until 2020 will enable SES to further develop and provide satellite-based healthcare solutions globally. LUXEMBOURG, 5 April 2017 -- SES (Euronext Paris and Luxembourg Stock Exchange: SESG) and the Luxembourg Ministry of Foreign and European Affairs today announced that they have extended a contract to maintain and support SATMED, an e-health satellite platform, until 2020. Under the new contract, SES will continue to develop the SATMED platform and its medical applications, support the platform’s data-hosting facility, and provide full user support with single point of contact. The agreement also includes the extension of the service to support new medical tools, as well as the provision of satellite connectivity over Africa, the Philippines and Bangladesh. The SATMED solution is designed to connect doctors and nurses based in remote locations to the outside world. Healthcare professionals will use satellite connectivity to access the platform’s medical applications such as e-training, accessing patients’ e-medical records, virtual consultation, and video conferencing. SATMED is also aimed at supporting regional development programmes and humanitarian operations in cooperation with both governmental and non-governmental organisations. Connectivity is enabled by the SES satellite fleet, while the SATMED web-applications and the encrypted back-ups are hosted in a secured data hosting facility in Luxembourg. Once deployed, the platform is delivered as a fully-managed service and includes helpdesk, maintenance of terminals and continuous user training. Everyone knows how satellite enables multiple applications such as TV broadcasting, GPS, or even reading an email while crossing the ocean. What fewer people know is how satellite can change lives. Last week, VSAT Stellar Awards announced SES Techcom Services as a winner in the “Changing Lives” category for its SATMED healthcare system. The awards, which were presented as part of the VSAT Global event in London, recognise the key individuals and companies leading the satellite industry into the future. Funded by the Luxembourg government, SATMED is an e-health platform which allows multiple medical applications and tools to operate together on a single integrated, cloud-based platform. Through its connection to the emergency.lu network and enabled by SES satellites, satellite internet connectivity can be provided worldwide, delivering humanitarian aid in remote and poorly connected areas. The e-health platform brings support in a range of different applications, such as providing communications with doctors and medical experts around the world, enables to diagnose patients remotely, and allows access video conferencing, data collection and analysis. SATMED uses SES’s global satellite network to connect healthcare provider’s IT infrastructure to the external world and provides a toolbox that enhances healthcare provision. Serving non-governmental organisations, hospitals, medical universities and other healthcare providers in under-resourced areas, it provides open access e-health services. 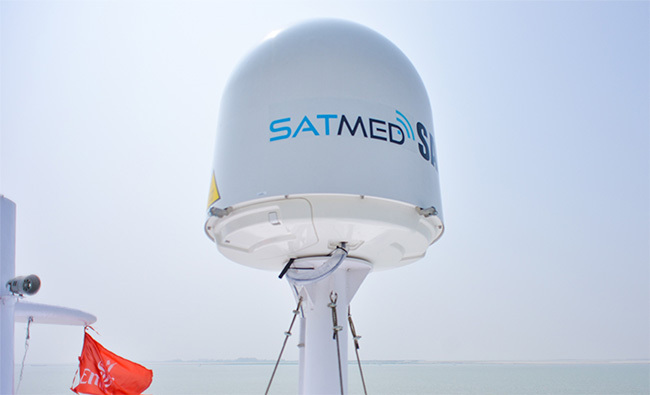 SATMED was deployed for the first time during the Ebola outbreak in West Africa in 2014. SES Techcom Services brought internet access to the Outpatient Clinic of Serabu Hospital in Bo District in Sierra Leone, geographically isolated with no access to higher level secondary care. Since then, the e-health platform has been brought to five other countries: a remote maternity hospital and Centre de Dépistage et de traitement de l’Ulcère de Buruli in Benin, a Hospital for Children in Niger, on the island of Mindanao in The Philippines, on three floating hospital ships in Bangladesh. The next deployment will be in Eritrea. 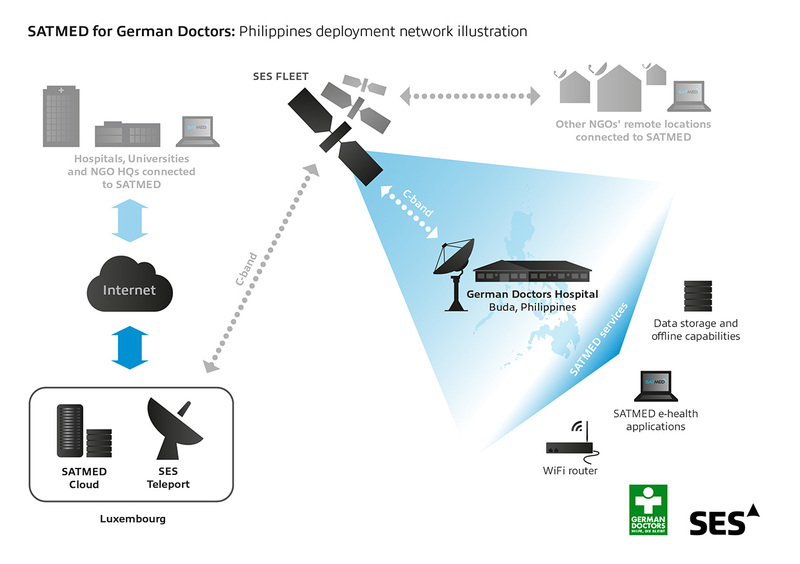 LUXEMBOURG/ PHILIPPINES, 22 July 2016 ­–The world-leading satellite operator SES S.A. (Euronext Paris and Luxembourg Stock Exchange: SESG), the Luxembourg Ministry of Foreign and European Affairs, and non-governmental organisation (NGO) German Doctors announced today the launch of satellite-based e-health platform SATMED in the Philippines. The SATMED solution was deployed at the German Doctors’ hospital in Buda, Marilog District, Davao City. SATMED will allow German Doctors to enhance healthcare provision and deliver accessible e-health services to remote communities on the island of Mindanao. German Doctors is one of the partner NGOs of SATMED during the ongoing pilot phase. SATMED can improve public health in developing countries by enabling multiple medical applications and tools integrated on a single platform over satellite broadband services. The solution was developed by SES Techcom Services, a wholly-owned subsidiary of SES, and is funded by the Luxembourg Government. The new SATMED solution deployed in Central Mindanao will enable German Doctors to provide better quality healthcare services when they visit remote villages. Using SATMED, teams can use portable devices such as tablets to collect the patients’ data. The data collected is then processed, aggregated and synchronised securely on SATMED’s cloud platform. SATMED’s text messaging functionality will allow doctors to keep tabs on large groups of patients living in remote villages, whose main form of contact with the outside world is through mobile phones. SATMED will enable German Doctors to communicate with doctors and medical experts around the world via video conferencing. Training of local medical professionals via SATMED’s e-learning solutions will be another opportunity. German Doctors is a non-governmental organisation working internationally by sending volunteer doctors to projects in the Philippines, India, Bangladesh, Kenya and Sierra Leone. German Doctors is committed to a life of dignity by providing healthcare and education to vulnerable and disadvantaged people in the project regions. 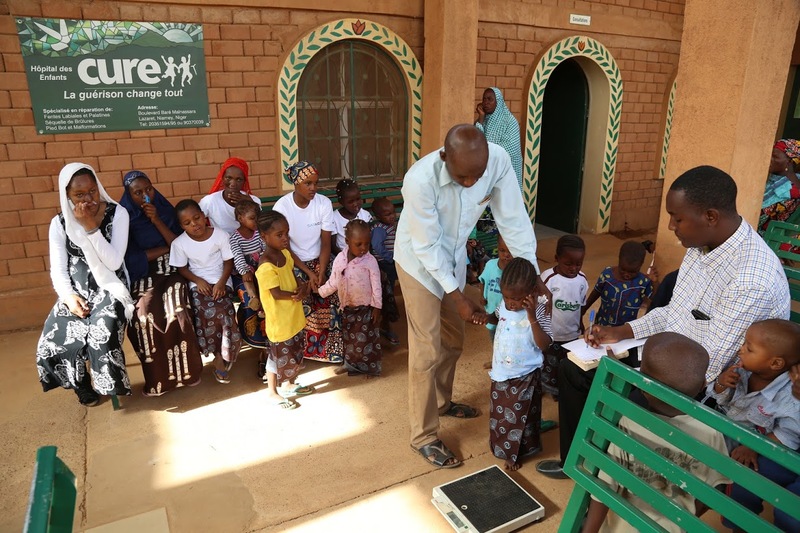 Preventative measures like feeding programmes or hygiene education are developed to improve patients’ long-term health situations. German Doctors grants help to everybody regardless of race, ethnic affiliation, religion, nationality, political belief or any other distinctions. The physicians work without remuneration for six weeks in their holidays or retirement. Since 1983, more than 3,000 physicians have worked voluntarily in more than 7,000 missions. Second SATMED deployment in Benin with NGO partner Fondation Follereau Luxembourg will treat Buruli Ulcer patients in Allada. LUXEMBOURG/BENIN, 8 June 2016 - SES S.A. (Euronext Paris and Luxembourg Stock Exchange: SESG), the world’s leading satellite operator, today announced the deployment of a SATMED e-health platform at Centre de Dépistage et de traitement de l’Ulcère de Buruli (CDTUB) in Allada, Benin, to improve awareness and healthcare. The SATMED e-health platform was conceived by SES Techcom Services, a wholly owned subsidiary of SES, and is funded by the Luxembourg Government and the Ministry for Cooperation and Humanitarian Action. 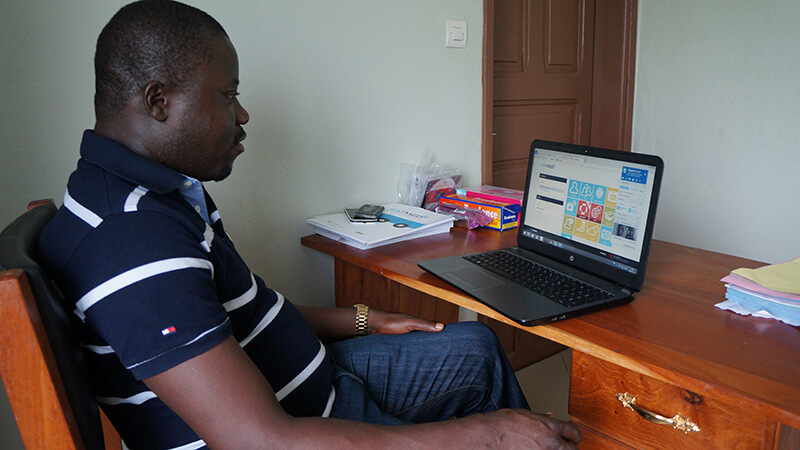 The first deployment of SATMED in Benin successfully took place at the remote maternity hospital of Ahozonnoude in June 2015. Services offered by SES Techcom Services, which is ISO 9001 certified, include the design and delivery of ground infrastructure and operational services, VSAT networks, broadband connectivity and turnkey teleport solutions. It also develops innovative solutions for e-government, e-health and e-education, as well as applications for worldwide emergency satellite communications. SES partners with CURE International to provide enhanced health services at children’s hospital. Need more information or would like a SATMED demo? Please let us know and we will get in touch with you.